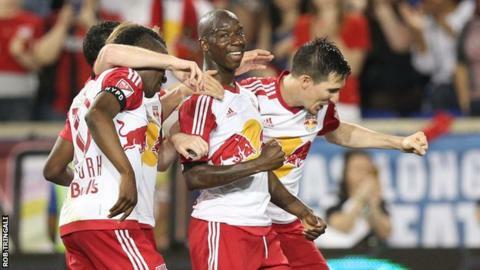 Bradley Wright-Phillips scored twice as 10-man New York Red Bulls beat New York City FC in Major League Soccer's first derby meeting between the sides. Former Manchester City and Southampton striker Wright-Phillips, 30, put away Lloyd Sam's cut-back in early on. And although Red Bulls' Matt Miazga was sent off after a second booking with 54 minutes to go, Wright-Phillips scored a second after the break. Patrick Mullins' late consolation was not enough to inspire a City fightback. New York City, owned by Manchester City, are a new addition to MLS this season and there was a raucous atmosphere in front of 25,217 supporters at the Red Bull Arena. Wright-Phillips, the son of former Arsenal and England striker Ian Wright, could have finished with a hat-trick, had he put away a one-on-one with City keeper Josh Saunders. But his side ended a three-game losing run despite Miazga's dismissal for two separate challenges on Khiry Shelton. It was an eighth game without a win for New York City and Spain striker David Villa, returning after a three-week lay-off with a hamstring injury, summed up the mood when he looked frustrated as he was substituted for eventual goal-scorer Mullins in the 68th minute.